I was working on a post on the Latin pantry for Devour the Blog when I decided to take a look at my own. I’m constantly straightening and organizing my shelves in the on-going game of kitchen Jenga that my limited New York storage space forces me to play. I can’t complain though because a few years ago my cupboards would have been bare. It took me awhile to figure out what I like, how I should store it, and how often I would use it. I hate waste and there were a few forgotten items staring at me resentfully from behind the much loved olive oil and sea salt, but I think I got it down to the essentials. I don’t know if it’s pure projection or all those chiles and peppers, but Latin American products seem to vibrate just a little bit more than others. I feel like if I winked at the woman on the P.A.N. Harina bag she just might wink back and I’m also absolutely terrified of the Abuelita on Nestlé’s Mexican chocolate discs though I’m sure she means well. 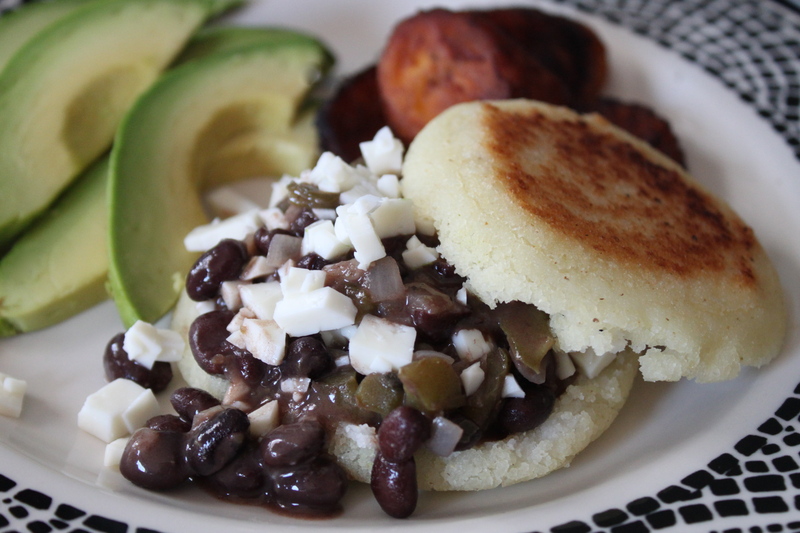 Newly in love with my spring cleaned shelves, I decided to make arepas de dominó, stuffed with black beans and cheese, relying mostly on what I had on hand. With little shopping to do apart from peppers and onions, I had to time to obsess about other things, namely what cheese to add. Though Mexican queso blanco and some Colombian varieties have become common, Venezuelans always complain about the trouble they have finding cheese north of Miami. Luis, my new market friend, pointed me towards El Cocotero that sometimes sells the fresh cheese they use in their restaurant. He recommended queso llanero or guayanés though I was only able to find the latter. The queso quayanés was closer to a fresh mozzarella or burrata than the queso blanco I normally use, not quite melting but pooling into the black beans and worth the trouble of seeking out. Since it opened up around the corner, I’ll use any excuse to visit Union Market. Bright, always stocked with samples, and piping in the a soundtrack that inspires occasional dancing in the aisles, it’s the breakfast at Tiffany’s of neighborhood grocery stores in that I can’t imagine anything bad happening there. Already planning on making arepas, this is where I met Luis who apart from the lead on Venezuelan cheese shared a few tips on how he makes arepas for his family, that Venezuelans call frijoles negros caraotas, and that where he’s from in the Eastern part of Venezuela they add a little sugar to the dough. He also suggested stirring in a little butter or oil to the masa. Small changes but they were definately the creamiest arepas I’ve made and even puffed up slightly as promised. The filling can soak through the arepa so I made them larger and thicker than usual. Combine the dry ingredients. Pour water into a medium mixing bowl. Add cornmeal in a steady stream, whisking constantly to avoid clumps. Stir in the melted butter or oil. Knead until well mixed and set aside to rest, about 5-10 minutes. Divide the dough in quarters and shape each piece into a ball. Using the bottom of a flat measuring cup or mixing bowl, lightly press down on the dough to form a disc about 1-1 ½” thick. In a cast iron or heavy skillet, heat oil over medium high heat. 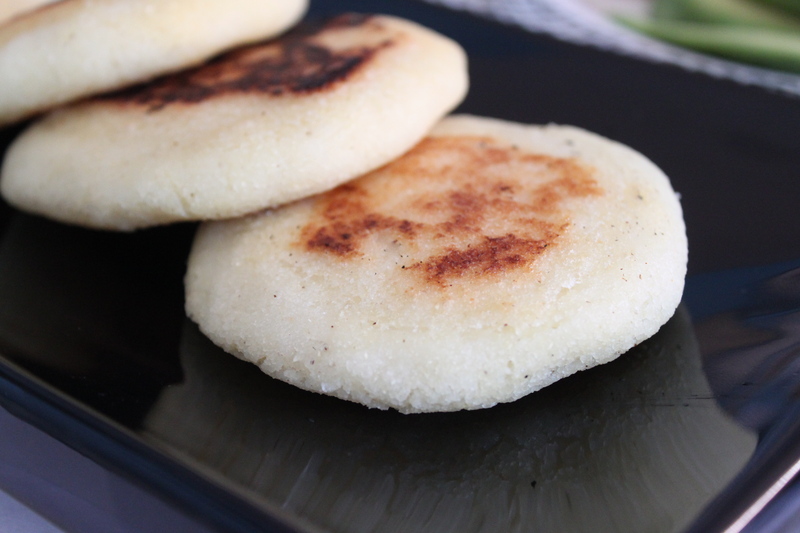 Add the arepas and cook until lightly golden and crisp, about 4-6 minutes on each side. Transfer to a baking sheet and bake an additional 15-20 minutes until cooked through. Split open and fill with caraotas negros and cubed cheese. Ah, once again, you make me hungry. Hey, I would love to have sweeter dough. How much sugar do you think? The cornmeal is a little sweet so I wouldn’t add more than a tablespoon if you’d still like to add savory filling. I’ve also tried arepitas dulces (https://hungrysofia.com/2010/06/28/andreas-arepitas-dulces/)here. my mouth is watering. I love beans and cheese! What a great idea! These looks so delicious. Can’t wait to try them. hi! 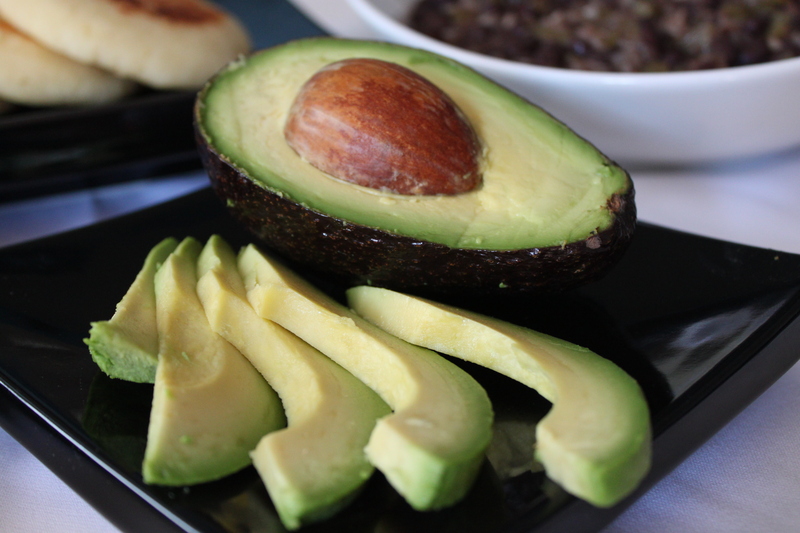 i’m from Venezuela so…i know how do it and eat it everyday.